We are often told to wait until the ice is thick enough before venturing out onto a frozen lake. But how can we know for sure when the ice is thick enough? And how long does it take for the ice to grow that way? In the last article, we learned why ice forms on the surface of the lake rather than at the bottom. It is due to the special properties of water. These properties allow ice to float on the surface of the lake because it is less dense than water. But what makes ice grow in the first place, and why does it sometimes take so long? At the surface of a body of water such as Lake Windermere, ice begins to form when water gets close to 0°C or its freezing point. Ice crystals are formed from rigid, hexagonal bonds between water molecules (seen in the photo to the left). As the hexagonal ice crystal forms, heat is lost to the atmosphere from the top surface of the growing crystal. This allows the water to completely change its phase from liquid into solid. Ice crystals initially form around suspended particles in the water (such as sediment, bacteria, organic matter, snow, etc.) in a process called “nucleation”. The first location, or particle, around which the ice nucleates is called the “nucleation point”. Once ice has nucleated and established itself in still water, it quickly propagates as crystals grow outward from the nucleation point in what is called dendritic growth. More crystals attach to the “arms” of the existing ice crystal structure, thus expanding the ice sheet across the water surface. Ice initially grows outward across the surface of the water since it is much easier for molecules to “latch on” to the rigid side arms of an ice crystal, rather than to the smooth bottom plane of the hexagonal ice crystal shape (again, see photo at top of article for reference!). Once that thin sheet of new ice has completely covered the surface of a lake, the ice will continue to grow in a predominantly downward direction. 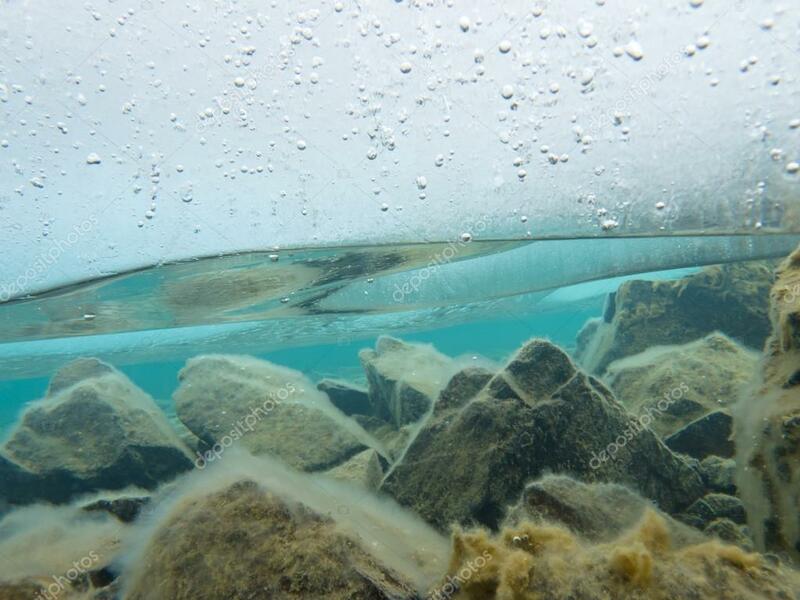 As water molecules attach to the bottom of the ice sheet, they cool and lose heat either to the surrounding water, or through the surface ice layers up into the atmosphere. This allows them to cool enough so they turn from liquid into solid, and form ice crystals. Over time, the number of ice crystals bonding together increases dramatically and the ice sheet becomes thicker. We’ve all heard that water freezes at 0°C. But once ice begins to grow in thickness, it acts as an insulator between the water below and the air above. In order for the water molecules to continue cooling down and change phase into ice crystals, heat from the water must be transferred somewhere else. Heat must either pass through the surface ice layer before being lost to the atmosphere, or be absorbed by the surrounding water molecules. As the surface ice thickens, it becomes harder for lake water to cool down quickly or warm up quickly and, as a result, it takes longer for lake water that is underneath the ice to reach its freezing point and turn to ice itself. The thicker the sheet of ice, the more insulation the water has, and the slower these temperature fluctuations occur. Besides air temperature and ice thickness, the rate at which new ice is added to the bottom of the ice sheet depends on many other factors: wind action, solar radiation, cracks or fractures in the ice, and any snow or frost build up on the ice surface which also acts as additional insulation. Despite this mix of environmental factors, there are still ways of determining how quickly the ice will grow. Scientists calculate how fast ice grows using the concept of “Freezing Degree Days”, or FDD’s. FDD’s inform a scientist as to how many days it will take an ice sheet to grow to a certain thickness. They first calculate the number of degrees below 0°C that the average air temperature was over the past 24 hours. The colder the air temperature, the more likely it is that ice is able to grow! An ice sheet will, in theory, grow at a rate of roughly one inch per fifteen FDD’s (but remember: as the ice gets thicker, the growth rate decreases because the ice acts an an insulator!). By knowing the number of FDD’s, scientists can approximate how many inches of ice will grow on the lake over the next few days, or guess how many inches have grown overnight. For example: if the maximum temperature yesterday afternoon was -5 degrees, and the minimum temperature overnight was -25 degrees, the average of these two extremes is -15 degrees. This is 15 degrees below zero, which gives approximately fifteen FDD’s for the 24 hour period. Therefore, the ice today should be about an inch thicker than yesterday. However, there are a number of factors that influence this prediction. Even a thin layer of snow or thick frost will dramatically slow the growth rate. It is important to keep in mind that predicting ice growth is never 100% accurate. The best way to know how thick the ice is is to go out and actually test the thickness for yourself – but you must be sure it can at least support your weight before you try this! So how does ice grow? As we can now see, it is impossible to know exactly how quickly ice is growing since it depends on so many factors to create favourable conditions for ice growth: air temperatures, wind conditions, radiation, snow/frost deposition, moving water… and all of this changes as the ice itself grows thicker. Freezing Degree Days (FDD’s) allow for rough predictions to be made about how quickly ice can grow, but the factors above are constantly changing and this makes accurate predictions very difficult. But hopefully this article has helped clarify the ways in which ice begins to grow and how it is influenced by the environment around us. First, the air and water temperatures must get cold enough that the water reaches its freezing point. Then, there must be an initiation of supercooling of the water molecules so that nucleation can occur. Following this, ice crystals must grow outward from the nucleation site, and more ice crystals must be added to the bottom of the surface ice sheet so that it grows in thickness. Finally, several environmental factors must combine to create favourable conditions for ice growth, and the rate of growth actually changes as the ice itself grows thicker. Thanks for reading! Subscribe to our facebook page for an alert about the next article, which will feature information about cracks and fractures in the ice and why they form!